John Goodman and John C. Reilly. Cast: Tom Hiddleston, Brie Larson, Samuel L. Jackson, John Goodman and John C. Reilly. Synopsis: “Kong: Skull Island” reimagines the origin of the mythic Kong in a compelling, original adventure from director Jordan Vogt-Roberts. In the film, a diverse team of explorers is brought together to venture deep into an uncharted island in the Pacific—as beautiful as it is treacherous—unaware that they’re crossing into the domain of the mythic Kong. The great ape roars back onto the screen in this spectacular reboot of the classic monster movie. This compelling, original adventure from director Jordan Vogt-Roberts (The Kings of Summer (2013) from a screenplay by Dan Gilroy, Max Borenstein and Derek Connolly, story by John Gatins, tells of a diverse team of scientists, soldiers and adventurers uniting to explore a mythical, uncharted island in the Pacific, as dangerous as it is beautiful. It’s the 1970s, at the end of the Vietnam War, when Bill Randa (John Goodman) gets his team together to make an epic journey to the remote uncharted island. But its natural beauty is soon revealed to be harbouring terrifying secrets in the form of enormous ape King Kong, revered by the locals as a God. But there are even deadlier threats to be faced if the team wants to make it off the island alive, namely the man-eating, subterranean skull-crawlers. 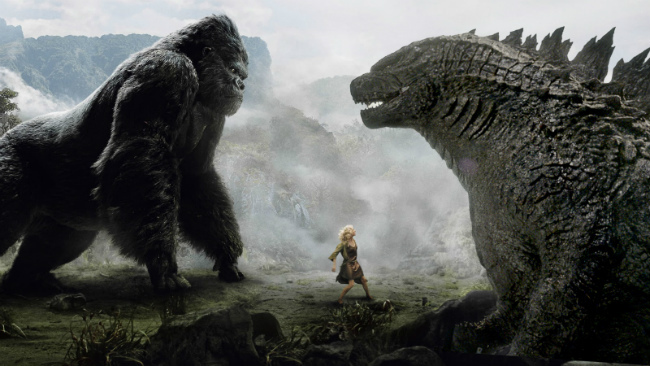 The latest instalment in Warner Bros’ ongoing shared monster universe that began with Godzilla, (2014) this all-action creature feature presents us with the largest incarnation of the rampagingly iconic Kong yet. He’s poised to fight the big lizard in the planned 2020 movie Godzilla vs. Kong. Fighting for their lives are an all-star cast led by Tom Hiddleston, Brie Larson, Samuel L. Jackson, John Goodman and John C. Reilly. To fully immerse audiences in the mysterious Skull Island, director Jordan Vogt-Roberts and his cast and filmmaking team filmed across three continents over six months, capturing its primordial landscapes on Oahu, Hawaii—where filming commenced–on Australia’s Gold Coast, and finally in Vietnam, where filming took place across multiple locations, some of which have never before been seen on film. With spectacular action sequences, fantastic CGI and a truly awesome Kong – this is truly a fun monster film.